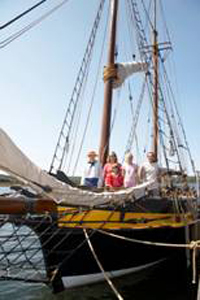 For 2019, Discovery Harbour is open seven days a week from May 18 to September 1. Sainte-Marie among the Hurons and Discovery Harbour are just 20 minutes drive from each other. Purchase one Adult Admission at either site and receive 50% off one Adult Admission to the other site! Offer can be used to September 2, 2018. The Fun Pass is a book of coupons that allows kids to get in free at 18 popular Ontario attractions while on summer vacation, when accompanied by an adult or senior. Fun Passes are being handed out in June to children in public and private schools across the province. $3.00 per person (includes detailed audio tour of site in choice of English, French, German or Spanish). Audio wands are free of charge during the Spring and Fall seasons. Site maps are available in English and French. Guided tours of the historic site are available in English and French and are recommended. Please inquire about our family and group rates. We accept Visa, MasterCard and Interact. U.S. dollars exchanged at current rates. Pets are allowed on a leash on the historic site. Bags provided to "stoop and scoop". Please note that pets are not allowed in the Restaurant, Retail Store, below-decks on the historic vessels H.M.S. Bee and H.M.S. Tecumseth, the H.M.S. Tecumseth Centre, and the Officers’ Quarters. Service animals are allowed in all areas. If you have any special needs, please call us in advance and we will do our best to accommodate you.